We had the opportunity to attend the home opener for the Minnesota Vikings on Monday Night Football on September 11. 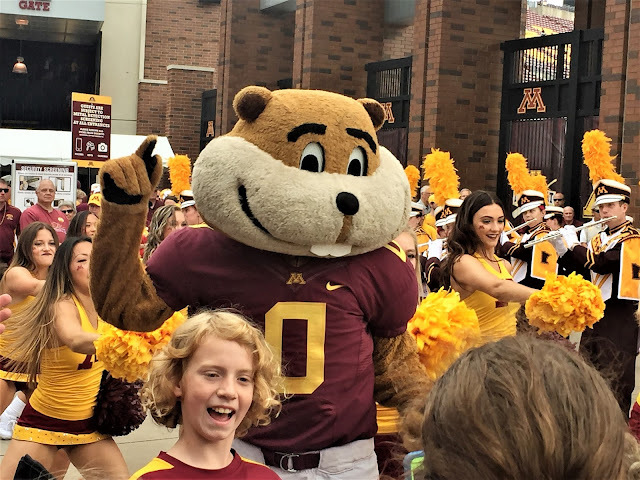 Avery goes to school across the street from US Bank Stadium at the University of Minnesota, so he was able to sneak away from classes and come enjoy the game with us. Our old friends, the Brown Family, have season tickets to the Vikings and were kind enough to meet us outside before the game and pose for some pictures. They're such an attractive family. This was the first time I'd been to US Bank Stadium when they had the big doors open. I'm glad they were because if I would have to open them myself I probably would have thrown my back out. This game was particularly special to attend as it was the return of our future hall of fame running back, Adrian Peterson. This was his big debut with the Saints but it ended up being a pretty big disappointment for him as he only had 18 yards on 6 carries. A lot of people booed at him while he was on the field, but I was always a pretty big fan of his. So I quietly clapped and smiled in his direction. I'm sure he appreciated that. We also had another Vikings legend in attendance. Randy Moss was there to be inducted into the Vikings "Ring of Honor". That guy is straight cash, Homie. Since it was 9/11, the team had a pretty nice ceremony to honor it. We all held up cards in the air and there were various messages around the stadium like "Never Forget". It ended with a flyover by a huge plane which was pretty surreal. Very nice job, Vikings. The game was awesome. Sam Bradford led the team with three touchdowns and 346 yards passing. The defense also looked solid and the team went on to win the game 29-19. Exactly the kind of game I like to go and watch! People give me a hard time because I always post a picture of the cheerleaders whenever I do a blog post on going to a football game. I'm not sure what the issue is. I know how hard they work and am just trying to do the right thing and pay them respect for a job well done. Thank you, ladies! Back home, the albino squirrels are still stopping by our house on a regular basis. Miss Sheri tells me they are always pretty sensitive to her getting near them to take their picture more so than their brown and grey counterparts. I'm guessing that's because they don't have the same ability to blend in and hide from predators thus they are a little bit more nervous. But that's just a guess. What do I know about squirrel psychology? On Friday night, we went out with the Walters to sing karaoke and celebrate Dan's birthday. Not necessarily in that order. Eventually we had some more fun people stop and join us. A good time was had by all. Dan celebrated his birthday a little too much, so as usual I had to get a little rough with him. I think he appreciates it when I help to keep him in line. On Saturday, we went to the University of Minnesota to watch them take on Middle Tennessee. Avery let us stop by his dorm before the game to drop off some stuff we bought for him. He then surprised the heck out of me when he volunteered to introduce us to some of his new friends. Of course, when I asked if he wanted to walk to the game with us he looked at me like I was insane. But we are making a little progress at getting him to accept us into his college life. Before the game, we ran into one of Luke's elementary school teachers, Jill Yarke, and her family. It was great running into them and their kids were so excited to be going to the game. I didn't get to see them afterwards, but I'm sure they were thrilled that the home team won the contest by a score of 34-3. Goldy Gopher was excited to see us and welcomed us to the stadium. We enjoyed watching the band perform before the game. We bumped into a really old friend of ours. 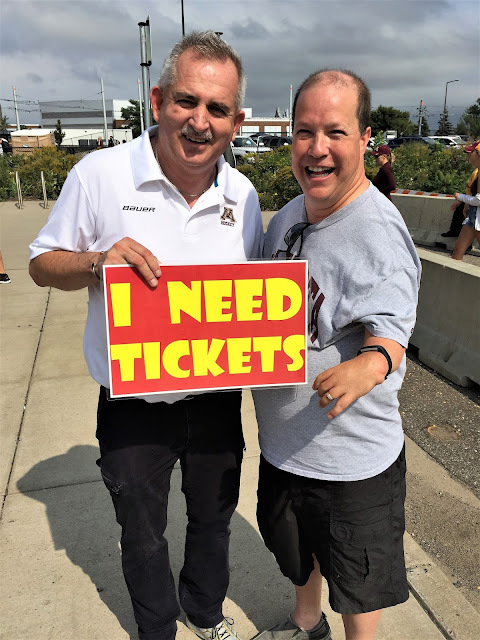 Ticket Tim has been buying and selling tickets outside of various stadiums and arenas since he was a little kid. He's a great guy and has a ton of fun stories from probably 1000+ different game days. 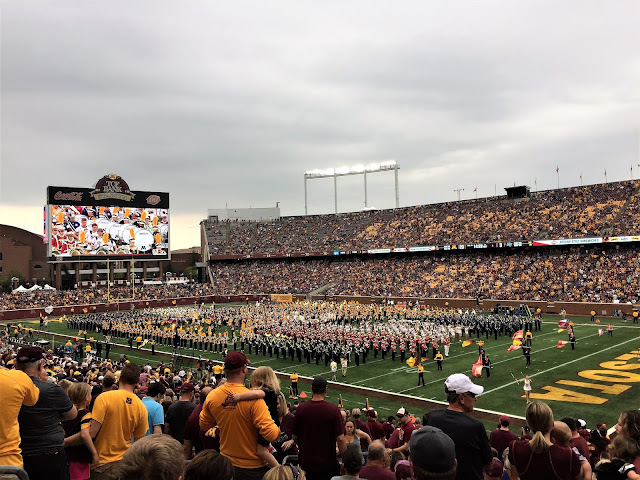 We had a special treat when we learned that several high school bands were in attendance to join the University of Minnesota band including our home town Prior Lake High School Marching Band. How cool was that! I drove down to Clear Lake, Iowa last weekend to see some of my old buddies. It was time for the annual "Cabin Classic" golf tournament hosted by Jason Alexander. Jason moved into a new cabin this year, but I guess it's still a cabin so the name "Cabin Classic" still works. He was nice enough to let me stay with him for the weekend. I really enjoyed waking up each morning and being able to see the lake outside. It's always a fun weekend of playing cards and golf and catching up on what everyone has been doing over the past year. This year we golfed in Garner, Iowa. The course is located in the middle of a cornfield which makes me feel like I'm home again. The fellows weren't too pleased about my University of Minnesota gear I wore all weekend, though. They think I'm some kind of traitor or something, but I've actually lived more of my life in Minnesota now then I did in Iowa. Dang I'm getting old. Since we had an odd number of people, we ended up dividing into three threesomes. I didn't get to spend as much time with a lot of the guys as I would have liked, but it was an absolute beautiful day for golf. Since my golf game is not the strongest, I was paired up with a couple of the better players. We actually ended up winning the first day of the tournament. It was best ball style game-play and we actually used more of my shots than I thought we would. It still wasn't very many, but more than I thought we'd use. All in all, it was another great tournament. After golfing, we thought it was a good idea to go on a boat ride. We cruised over to the Tiki Bar to have a drink and put a dollar bill on the wall to commemorate the weekend. Whoever's idea it was to put dollar bills all over the walls of this place was really thinking. There's gotta be a couple of grand up there by now. We picked up the rest of the crew, had a leisurely evening cruise and shared some good laughs. It was another really fun weekend. Back at home, the albino squirrels are making visits to our house more and more frequently. We actually saw two different ones at the same time, although we haven't been able to get them both in the same picture yet. We are thinking they are wondering where Luke and Avery moved to and are stopping by more often until they see them again. Our friend, Cathy Klimek, knew about our fondness for the albino squirrels and how we see them as kind of our "Guardian Angels" over our boys and their health situation. She sent us these as a gift and we thought that was pretty darned nice of her! One albino squirrel for each of us and then a replica of Blue to chase us all around the yard. Labor Day weekend typically represents the end of summer which is always a bit sad for me. Living in Minnesota has it's challenges weather wise and moving into Fall is always a reminder that winter is right around the corner. We do our best to get out there and see the sunsets while it's still warm enough to want to stand outside. Luke and Jackson decided to come home for a couple of days over Labor Day weekend. Apparently a lot of the kids at MSU Mankato go home for the holiday, so they decided to join them. After being home for about 5 minutes Luke announced that some other friends were coming to pick him up and he was going out for the rest of the night. That 5 minutes was real pleasant, though. Luke and our family have received several generous gifts after dealing with his recent health scare. This special "college student care package" was given to him by a group of my co-workers. 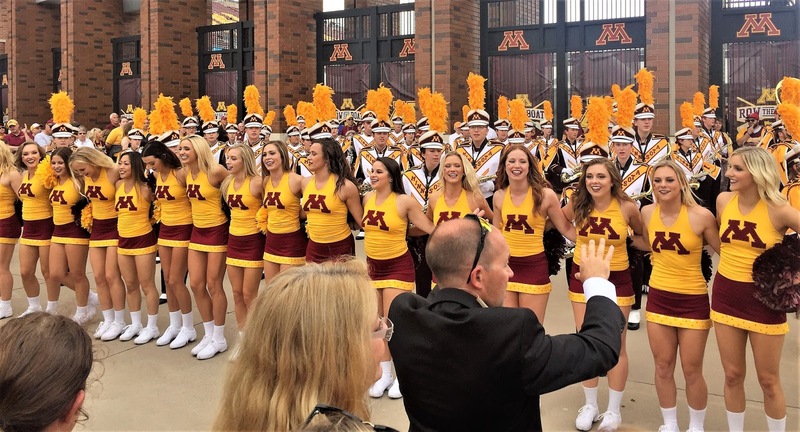 It included several items from the Minnesota Vikings which were autographed by players like Sam Bradford, Stefon Diggs, Dalvin Cook, Xavier Rhodes and Adam Thielen. He was extremely excited and grateful for such a nice gift. Thanks to all of our friends who have been so generous with the gifts and prayers for Luke. My team at Oracle is an incredible group who took the time to put together this package and reach out to the Vikings for their support. I'm pretty lucky to work with such awesome people!! On Saturday, we went to a friend's cabin for a day of fun, bean bagging, boating, and relaxing. Sue Korkowski invited us to her place on Fish Lake where she and her family have been going since she was a kid. We were excited to be there so we could all act like we were kids again. When I found Ron in the backyard, he was very busy with his meat. I kind of felt bad for disturbing him, but he seemed genuinely happy to see me. Miss Sheri and I had fun going out on the kayaks. I struggled a bit at first because when I go out on a kayak by myself, I have a tendency to row my boat in circles. Miss Sheri was so nice. She let me tie on to her boat so she could help me do some rowing on the left side and go straight for awhile. A bunch of Sue & Ron's family and friends were also spending the weekend at the cabin. We had fun meeting them and getting to know one another. We went out for a boat ride with the whole crew and three dogs which made for a bit of a crowded boat, but it was quite enjoyable. What a great way to spend Labor Day weekend!! On Monday, we went to the Great Minnesota Get Together, The State Fair. I'm not sure if I'd call it great, but at the very least it was a Really Good Get Together. The reason I have a tough time calling it great, is because there's just so many dang people there that also are Getting Together. I like people as much as the next guy but sometimes it's really hard trying to walk near so many of them. In the 12 days the fair is open, almost 2 million people go there to eat food on a stick, collect free yard sticks at the Merchant Mart, and witness the terror of farm animals giving birth in one of the barns. We couldn't wait to join them! I always worry a little about rodents running rampant at this place with so much food being eaten and dropped on the streets and stuff. Sure enough, I discovered a huge fuzzy critter shortly after arriving. I always love going into the art buildings to see what the creative people are doing with their lives. Globe heads are apparently really IN this year. Soon enough, we saw more rats and figured this place just must be absolutely infested, so we left. Hopefully they get some traps next year so we can go back and not worry about this stuff. After the fair, we stopped at a pizza party hosted by our good friends, Cathy and Jeff. Jeff makes really good pizza! We are slowly getting adjusted to the empty-nester lifestyle. We certainly miss seeing our boys every day, but we are finding more opportunities to go out with one another which is really nice. We decided to start an Empty Nesters club with other fun parents we've met in Prior Lake who have also recently had to give up some or all of their children to college. It's nice to suffer through the loneliness with a bunch of other good people. We had several good friends show up throughout the night which was great. Hopefully, we can keep this tradition alive.